To say that the funeral service industry is changing would be an understatement. The rise of green burials is bringing with it a whole new industry, and to be successful, you have to be on top of it. Families are more concerned than ever with the expenses associated with cremation and are looking for alternatives and less expensive methods when available. We are more connected than ever, but also more spread out than ever, so mortuary shipping has evolved to keep up with the changing landscape and technology to increase efficiency. But, the funeral service itself has changed as well, and as the internet provides more examples of creative and unique ways to say goodbye to our loved ones, the traditional funeral experience is becoming a thing of the past. So what do you do when someone comes to you for a non-traditional funeral service? If you are used to just preparing for funerals at your facility, and someone walks in and requests a funeral on a beach or at a local park, where would you begin? These types of events are becoming more and more popular as people begin to look at them as celebrations rather than goodbyes. Your funeral home has to be prepared for any number of scenarios where a family wants you to assist with a funeral that will take place outside of the walls of your home. So, where do you begin? Make sure that the family is making a good decision. As with any funeral planning session, you want to begin with a good discussion. Listen to what the family is saying and help them make sure that a non-traditional service works for them. Let them know that there could be additional expenses and that paperwork and permissions might mean that the process cold take a little longer as well. Let them know that you will help in any way possible, but that once the process begins, it could be tough to revert to a traditional service, so allow them the time they need to make sure that they are making a sound decision initially. Factors like weather, traffic, accessibility and other unseen obstacles might need to be addressed, so think of every possible scenario you can while helping to plan out this type of service. Encourage pre-need services to all of your families. This is another reason why pre-need services are so important in today's market. The more you know ahead of time, the easier it will be to plan out non-traditional services. Pre-need isn't just about saving money - it's about making sure that the family gets the service they want and increasing the likelihood that you'll be successful in delivering it. It might be too late in some instances, but for those families you know well, it doesn't hurt to have the pre-need discussion so that everyone is on the same page going into a non-traditional event. Many people are considering non-traditional burial sites to go along with their non-traditional services. Home burials are increasing in popularity now that cemeteries are becoming overcrowded and space is limited. In most states, this is legal, but they do usually require a funeral director to handle arrangements. In many states, embalming is required for a home burial, so if the family doesn't want their descendent embalmed, that could raise an issue. Check with your local authorities to see about limitations. There are also people requesting to be buried at their favorite park or other alternate sites. Believe it or not, this could be a viable option depending on the facility. It's always worth asking if it means a family finds comfort, so don't be too quick to say it can't be done. Remember it's not about you. A funeral service at a bowling alley might not be the way you would choose to say goodbye to your loved one, but for a grieving family, this might be the closure they need. Remember not to judge and just support the family in any way you can to make the occasion as special for them as you can. As the internet gives more and more access to what other people are doing around the world, the ideas that pour in might get more and more abstract compared to a traditional service. Do what you can to accommodate and assist in any way possible. Think about incorporating some ideas into your marketing. Be proactive. If you live by a body of water, it might not be a bad idea to contact someone with a large boat to talk about collaborating on sea burials. Spreading ashes in the water is a great tribute to those who love the aquatic life - why not make this a package you offer? Collaborate with a local park to offer services there for people who loved the outdoors. You might even be able to collaborate with a local sports team to have funeral services at their stadium for the devout fan! If you can provide alternative services and find a way to market them, it could be the perfect way to offer the family what they need and still keep the service profitable for your business. Non-traditional services mean non-traditional planning. 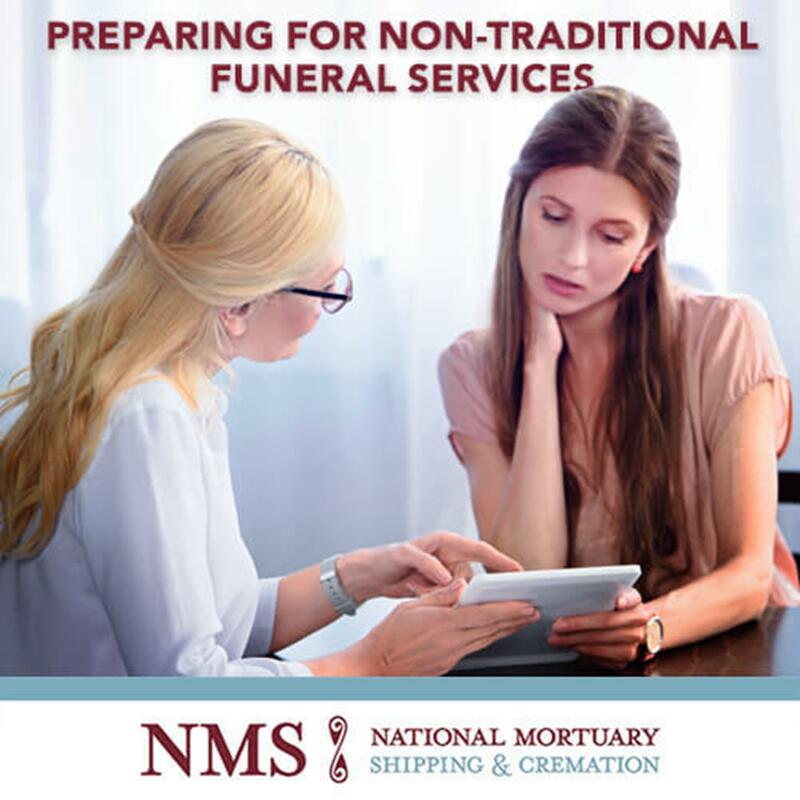 At National Mortuary Shipping & Cremation, we've seen it all. It's our job to help you make arrangements, no matter how far outside the box they might be. From shipping a body internationally to arranging for gravesite ceremonies, we are here to make sure that you are taken care of so that you can take care of the families that are depending on you. Contact NMS today, and let us give you our traditional, excellent service for your non-traditional customer!